There’s one thing that all Alpine, CA, residents can agree on: California’s hot summers and cooler winters are tough to battle. However, they don’t have to be. By equipping your home with reliable HVAC armor, you are guiding your home toward home comfort victory—and the team at Mauzy Heating, Air & Solar can help. Our HVAC company is dedicated to keeping you comfortable—day in and day out. From dependable heating and cooling system installations to swift unit repairs, Mauzy offers Alpine residents the HVAC services they need to attain and maintain complete contentment. Trust our team with all of your heating and air conditioning needs. We promise you’ll feel the difference—literally. In the summer, California’s temperatures can be sizzling hot. But, that doesn’t mean your home has to be. When you choose to protect the wellbeing of your air conditioning unit, you are certifying that your home will keep its cool—no matter what. However, protecting the health of your air conditioning unit requires three things: a proper AC installation, swift system repairs and thorough maintenance services. From a new air conditioning unit installation to an AC system replacement, the team at Mauzy promises our certified technicians will install your system properly the first time around. This means, not only is it guaranteed that your system will operate efficiently, but it will deliver reliable and continuous chilled relief, too. Once complete contentment is attained, it must be maintained by providing your AC unit with the TLC it needs. 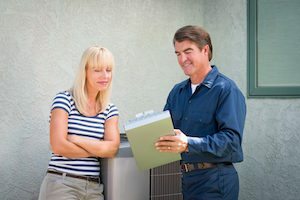 So, from in-depth seasonal maintenance to thorough system checkups, Mauzy’s air conditioning maintenance services in Alpine, CA, are the sure-fire way to lengthen your system’s lifespan, decrease high-energy bills, eliminate the potential of costly repairs and help you save money—all year long. Keep in mind, when your system needs an AC repair, it’s crucial that you restore its operation right away. The sooner you repair your system, the more likely you are to stop a minor hiccup from escalating into a major catastrophe. This rings true for both your home comfort and your budget. So, when you need a swift and efficient air conditioning repair, a dependable AC installation or replacement, or thorough maintenance services, you can count on the best HVAC company in Alpine to get the job done—and that’s Mauzy. There’s no denying it. Living without a heating system can make your blood run cold. So, when California’s cooler weather arrives, homeowners begin to crave a warm oasis to call home. Thankfully, Mauzy’s team has your back. Our heating services are undeniably the warmest and friendliest around. From our dependable furnace installations to our reliable heater repairs, our team has the expertise and range of services to keep your home cozy—day in and day out. And best of all, we go the extra mile to keep you comfortable, ensuring the cooler winter weather never leaves Alpine residents with cold feet. So, cozy up to our heating services and we promise to keep you snug—all winter long. Whether you’re looking to save money on your electricity bills or to change up how you power your home, look no further. Mauzy’s team has an energy solution that will have you looking on the sunny side of savings. Our solar panels and residential solar system installations are the environmentally friendly way to power your home. And, even though solar energy is an initial investment, don’t sweat it. You will begin seeing the savings right away. To find out whether solar energy is the right choice for your home, contact our solar contractors today. Mauzy’s comfort specialists make it easier for you to achieve a more comfortable home at a more budget-friendly price. For more information on how our heating, air conditioning and solar energy services can be beneficial for your Alpine home, fill out our online form or call our team at 858.900.3909 today!